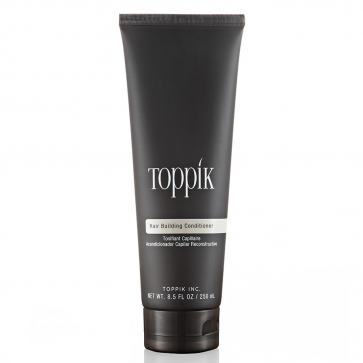 Toppik Hair Building Conditioner gives thin, thinning or damaged hair a fuller look and feel. The nourishing complex of Keratin proteins and aloe leaves hair stronger, thicker and healthier looking. Apply Toppik Conditioner to shampooed hair, focusing on ends. Leave on for 60 seconds and rinse thoroughly. Dry and style as usual. For even thicker-looking hair, follow with Toppik Hair Fattener (pictured to the right).